He does not have any family relationship with any director and/or major shareholder of BHB nor does he have any conflict of interest with BHB. He has not been convicted of any offence within the past 10 years. He has no family relationship with any director and/or major shareholder of BHB nor does he have any conflict of interest with BHB. He has not been convicted of any offence within the past 10 years. She does not have any family relationship with any director and/or major shareholder of BHB nor does she have any conflict of interest with BHB. She has not been convicted of any offence within the past 10 years. She does not have any family relationship with any director and/or major shareholder of BHB nor does he have any conflict of interest with BHB. She has not been convicted of any offence within the past 10 years. 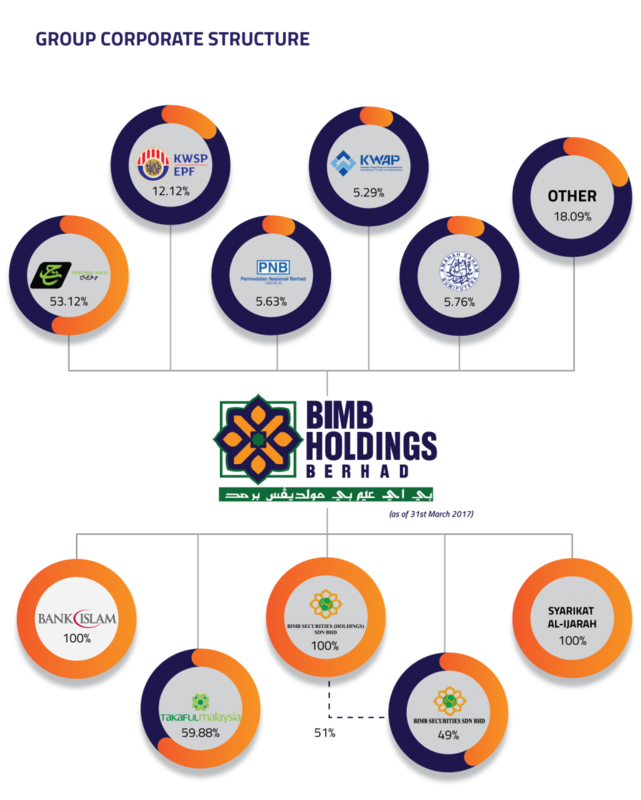 Mohamad Azlan bin Mohamad Alam joined BIMB Holdings Berhad on 11 August 2008 as its Chief Financial Officer. He was appointed to his current position of Chief Operations Officer on 27 April 2015. He has over 17 years of working experience in finance, mainly within the financial services industry. He began his career with Coopers & Lybrand Malaysia (now known as PwC) where he served for six years in Audit and Business Assurance services. He holds a Bachelor in Accounting from Universiti Teknologi MARA. A chartered accountant by training, he is a Chartered Accountant of the Malaysian Institute of Accountants (MIA) as well as a member of the Chartered Association of Certified Accountants (ACCA) and a member of the Institute of Chartered Secretaries and Administrators (ICSA). Malkit Singh Maan was appointed as Chief Financial Officer of BIMB Holdings Berhad on 11 May 2015. Until his current appointment, he has been directly responsible for the financial management of Bank Islam Malaysia Berhad, a role he has assumed since January 2008. With over 25 years of working experience in finance, he has been actively involved in the banking sector, addressing a number of industry-related issues within the banking institutions. Prior to joining Bank Islam, he held diverse posts in several local and foreign banks. He is a Certified Practicing Accountant (CPA) member of the Australian Society of CPAs and Chartered Accountant of the Malaysian Institute of Accountants (MIA). Puan Maria Mat Said joined Bank Islam Malaysia Berhad in August 2005 and is the current Head of its Legal & Secretarial division, responsible for the provision of legal and corporate secretarial services. She was appointed as Bank Islam's Company Secretary on 29 January 2009, and has since taken the role of ensuring proper governance within Bank Islam and BIMB Holdings Berhad. Puan Maria Mat Said has over 24 years of experience in performing legal functions within the banking industry. Encik Razman Ismail was appointed as Head of Group Human Capital for BIMB Holdings Berhad on 27 April 2015. He joined Bank Islam Malaysia Berhad on 1 July 2014, as Head of its Human Resources (HR) division. Encik Razman carries with him 21 years of working experience in the HR sector, both as consultant and practicing HR professional. He held various senior HR-related posts at a number of renowned banking institutions prior to joining Bank Islam. Encik Razman started his career at a consulting firm before moving on to a major multinational company. As a consultant, his client engagements encompass various HR functions from organisation development, rewards, performance management, talent assessment as well as merger and integration. Encik Razman holds a Bachelor’s degree in Management with a major in human resources and a minor in communications from Universiti Sains Malaysia. Ustaz Mohd Nazri has over 11 years of experience in Shariah management within the Islamic banking industry. He first joined Bank Islam Malaysia Berhad in June 2004 before taking up the position of Shariah Audit Manager at Noor Investment Group at Dubai, UAE, in June 2004. During this period, he was appointed as a member of Bank Islam's Shariah Supervisory Council. Ustaz Mohd Nazri re-joined Bank Islam in January 2011 in his current position, and is instrumental in strengthening its Shariah governance framework and facilitating efforts to promote Shariahcompliant products and services. Starting his career as a tutor at University of Malaya where he was also a graduate student, Ustaz Mohd Nazri continues to serve his alma mater as an academician. Ustaz Mohd Nazri is also the Deputy Chairman of the Shariah Supervisory Council of Amana Bank Limited in Sri Lanka; Accredited Panel of the Finance Accreditation Agency; Member of Professional Practices Bureau Association of Shariah Advisors; Accredited Trainer for Islamic Banking and Finance Institute of Malaysia; and External Shariah Advisor of Ghazanfar Bank in Afghanistan. In May 2014, Ustaz Mohd Nazri was selected as the recipient of the ͞"Promising Young Banker Award 2014" by the Asian Banker publication. Ustaz Mohd Nazri holds a Master’s degree and a Bachelor’s degree in Shariah (Islamic Jurisprudence) from University of Malaya where he currently serves on as an academician. Dato' Sri Mohamed Hassan Md Kamil has been at the helm of Syarikat Takaful Malaysia Berhad as its Group Managing Director since 1 April 2007. As of 25 April 2017, he holds the position of Group Chief Executive Officer of the company. He was appointed to the Board on 1 September 2006 as a Non-Independent Non-Executive Director of Takaful Malaysia He is also the Chairman of the Board of Commissioners of P.T. Syarikat Takaful Indonesia and P.T. Asuransi Takaful Keluarga. He has had quite an extensive working experience in the United States, having worked there as an Actuary from 1987-1994 prior to returning to Malaysia as Deputy General Manager at Malaysia National Insurance. Dato' Sri Mohamed Hassan joined ING Insurance Berhad in 1996, holding the posts of Senior Vice President and Chief Actuary. He became Deputy General Manager for P.T. AIA Indonesia in 2004. He holds a Bachelor of Science in Actuarial Science and a Master in Business Administration (Finance) from University of Iowa, USA. He is also a Fellow of the Society of Actuaries. Encik Rashid Ismail has been the CEO of BIMB Securities Sdn. Bhd. since January 2011. Prior to that, he served as the CEO for MIDF Property Berhad, an industrial property developer and a subsidiary of Permodalan Nasional Berhad (PNB). Encik Rashid has more than 10 years of working experience in the banking industry before his professional career took him into the stockbroking sector. He started his stockbroking career in 1990 as a General Manager at Seagroatt & Campbell before leaving to join PB Securities in 1994. During his tenure at PB Securities, he was seconded as a member of the task force to establish MESDAQ as well as spearheading the collaboration between KLSE and MESDAQ. He later joined MIDF Sisma Securities Sdn. Bhd. in 1998, assuming the position of CEO and Executive Director Operations. Encik Rashid was later appointed as Head of Strategic Planning at MIDF Group in 2006. For the duration of his service term at MIDF Group 2006 - 2010, Encik Rashid was made board member of various companies that were under the purview of Securities Commission and Bank Negara Malaysia, which included MIDF Amanah Ventures Sdn. Bhd., Amanah Property Trust Manager Sdn. Bhd. and MIDF Consultancy and Corporate Services. He was also a board member of Amanah Ascott Properties (KL) Sdn. Bhd., a hospitality joint-venture business with Singapore Ascott Group. En Rashid is currently the Chairman of the Association of Stockbroking Companies in Malaysia (ASCM) and Board Member of Bursa’s Market Participant Committee (MPC). He is also the Member of Board of Trustee for Bumiputera Dealers’ Representative Education Fund (BDREF) and Member of Board of Trustee Bumiputera Trading Fund (BTF) at Securities Industry Development Corporation (SIDC). He is also the member of Bursa’s Securities Market Operations Committee (SMOC). Encik Rashid holds a degree in business, majoring in accounting from Edith Cowan University, Australia. He is a Chartered Accountant (CA) registered with Malaysian Institute of Accountants (MIA) and is a Certified.